It is the age of the e-reader. Or rather, the start of the age of the e-reader. The printed book isn’t going to go away, whatever some believe, but e-readers are taking a prominent place in our world. I used to lug books everywhere. Now I just have to drag my Kindle. Unfortunately, with the rise of the e-books, comes the rise of a format war. Any of you remember Word Perfect? Or Betamax tapes? HD-DVD? None of those are around anymore. Word beat Word Perfect, VHS beat Betamax, and Blu-Ray crushed HD-DVD. Format wars happen all the time. One of the oldest ones is from the late nineteenth century, when there was a war of currents. Two or more companies decide to put out their own format and try to make theirs the new standard. Whoever wins is set to rake in the money. In the world of e-books the battle is currently raging between Epub and AZW – the latter better known as the Kindle format. A format – in this case – is a standard that tells programmers how to convert the e-books to bits and how to convert the bits back to a correctly displayed book on screen. 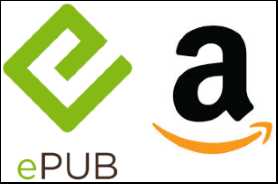 Amazon is the main (and only) one on the AZW side, while the Epub side has several major publishers, and companies like Apple. You shrug now, and think this won’t affect you. There’s a good chance it will affect you if the war ends. Commonly, at some point one of the sides in the format war loses. In this case, either Amazon will ‘win’, or ‘the rest’ will. If you are on the losing side, you’re then screwed. Imagine you had built up a nice HD-DVD movie library. Blu-Ray won out, so now you’d be stuck with a movie collection that will be useless once your HD-DVD device breaks down. In the case of the e-book format wars, if Amazon wins out, and you have epub books, you might have to buy all your e-books again. The same could happen if you have Kindle books and Amazon loses. Even if your side wins, the next step could be stagnation. Without competition, there is no need to innovate. For instance, I hate the Microsoft Word user interface, but I am still forced to use it, because there is no alternative. In e-book land, if Amazon wins, you’ll start seeing the end of everything but the Kindle and the Amazon store. Epub is an open format, meaning that if that wins out, stagnation might not be the end result. It’s not all doom and gloom of course, because luckily, e-books are just files. And files can be converted to other file types. Amazon has a converter to convert Epub to Mobi (which Kindle currently supports), and there are ways to convert them back. Of course, it doesn’t always work. That has to do with differences in the formats. If you look under the hood, epub is just a zipped set of HTML files. HTML is the stuff web pages are made of. Mobi is a proprietary format, but it’s also compressed text with markup. It’s possible to convert one to the other, but the supported layout options are slightly different. Maybe the left margin will be different after conversion, or the font, or any number of small things. Worse, some things can crash your e-reader. I’ve had my Kindle freeze up on a specific page in a book converted from epub. To get technical: there was a block-element inside a paragraph element on that page of the epub, which is illegal HTML, and Kindles apparently don’t like. So, conversion is usually possible, but not always. And it can break layout. You could ask why Amazon and other distributors even want this war. Wouldn’t it be easier to have one format? Or a device that can access all books? Yes, that would be wonderful, but it would be wonderful for consumers, not the producers. Amazon wants what Apple and Google already have on smart phones: you have to go through their store. If your entire library of books is tied to Amazon and only Amazon, your next device is going to be another Kindle, and your next book is going to be bought at Amazon. The other side of these format wars is basically everybody but Amazon. They mostly want to get out from under Amazon’s heel. If Amazon wins, their business model is dead in the water. They don’t have the options to use AZW or support their stores on Kindle. Amazon won’t allow it. And of course, whoever blinks now and switched format, has to pay the extra costs of implementing a new format. So, it costs both sides money to give up, and it doesn’t gain them anything; there’s no end in sight. Unclear at the moment. If market share in the US is an indication, Amazon is wiping the floor with the rest of the e-book industry. However, now they’re taking Europe, and the European Union is less tolerant about anti-trust issues and tying. I’d say that Amazon is pulling ahead, but they haven’t won yet. There will be negative consequences of this format war, but there is no end in sight yet, and not much that you can do as a consumer. The only thing to do is be aware that your e-book collection might not be supported a few years from now. Back it up, preferably in another format, and wait out the storm.